How to change Signature in GMAIL? How to change signature in Gmail? With this article we have explained each and every step you need to do to change your Signature or even add new signature in your Gmail Email Account. Login to your Gmail Account. 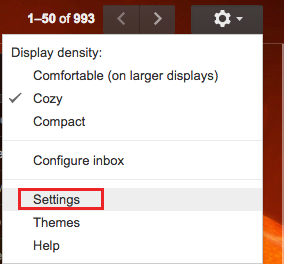 Once you are in your Gmail Mailbox on the top right corner just below your Gmail account picture you’ll see Gmail setting icon. If not able to find it check the image below for reference. After getting where the Gmail setting icon is click on it. Now you’ll have scroll down and find it on the same page. Or you can check on the image below for reference. Under this Signature you see the radio bottom is highlighted on ‘No signature’. Now you will have to click on radio bottom right under the ‘no signature’. After that click on it or you just click on the blank space. Type-in your signature and the radio bottom just switches. Now enter your signature in the blank space. If you already have your previous signature you’ll see our old signature and you can as well change it. If you would like to have “Insert this signature before quoted text in replies and remove the “–” line that precedes it.” click on the correction box else leave it as it is. Now to save what you have done on how to change signature in Gmail you’ll need to scroll down and you’ll see ‘Save Changes’ in a very small box. Hope this article was helpful for your and was useful as well. Please share this to your family and friends. If they also want to add or want to change signature in Gmail. How to Change Signature in Yahoo Mail or Ymail?